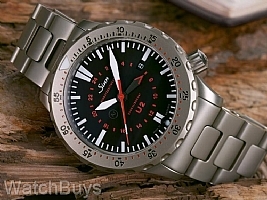 The Sinn U2 has been one of our best selling watches since it made its debut shortly after the Sinn U1. This was the first watch in Sinn's U Series to earn the EZM designation. But one feature that the standard Sinn U2 did not offer was a fully Tegimented case (the standard Sinn U2 features only a Tegimented bezel). Because the Tegiment process does such a great job of protecting the watch against scratches and other abrasions, we asked Sinn to produce a special run of fully Tegimented watches for us, which they have just completed. The Sinn U2-T features the same great case design made in-house from German submarine steel at Sinn's case making facility in Glashutte, Germany. Once the case is complete, the Tegimenting process begins, and when we say "fully Tegimented" we mean what we say - case, crown, bezel, case back, bracelet and buckle. Step up to the EZM 5 Professional Series with the Sinn U2-T. The technology and design elements used to create the Sinn U2-T go far beyond standards used at most watch companies. The Sinn U2-T case is made from the same German steel that is also used in the construction of the outer hull of submarines. The steel was procured by Sinn from a steel supplier to Emden GmbH, one of Germany’s North Sea shipbuilding yards who construct submarines from the very same steel. This special steel is also amagnetic which means that is does not have magnetic properties and cannot itself become magnetized. The watch movement itself is protected from magnetic fields up to 4,800 A/m. The uni-directional ratchet operated rotating bezel is also milled from this submarine steel which is Tegimented. The indices are machined directly into the bezel without the use of bezel inserts, which can corrode or come loose at deep depths. The international testing lab of Germanischen Lloyd has tested the U2, and determined that the watch can be certified as water resistant to 2,000 meters. This same firm tests submarines for their ability to withstand the effects of underwater use. The Sinn U2-T has full UTC functionality through the use of an additional short red tipped hour hand which can be set independently from the primary time zone and indicates the second time zone using a 24 hour display. Screw down crown. The U2-T features an inert gas filled cavity with two copper sulphate humidity absorbing capsules, which are visible at 6. Matte black dial with date at 3, Super Luminova on hands and markers, and striking red seconds hand complete the design. Other features include sapphire crystal with anti-reflective coating, and metal stainless steel bracelet which is also hardened using the Tegiment process.